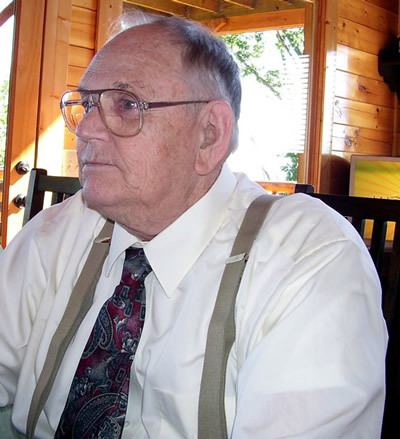 W. Dale Carter, October 2007. Sullivan County Manuscript Collection 0062. The collection was placed on loan by W. Dale Carter to the Archives and History Division, Sullivan County Department of Archives and Tourism in September 2009. W. Dale Carter Papers. MSS 0062, Archives and History Division, Sullivan County Department of Archives and Tourism, Blountville, Tennessee. This collection contains well-documented information pertinent to the history and genealogy of Sullivan County, Tennessee and surrounding areas. Of particular interest are Mr. Carter's documented papers on corrections to traditions about historic sites in the region. William Dale Carter was born 1926 in Hiltons, Scott County, Virginia to Rev. Thomas Raleigh Carter and Clara Maude Carroll. He graduated from Hiltons High School, Scott County, Virginia, and attended Berea College for one year before enlisting in the Army Air Corps aviation cadet program during WWII. After the war, he graduated from the University of Missouri School of Mines with a degree in Chemical Engineering. He was employed by Eastman Kodak and retired in 1986 after 36 years of employment. Mr. Carter has conducted extensive historical and genealogical research in East Tennessee and Southwest Virginia.